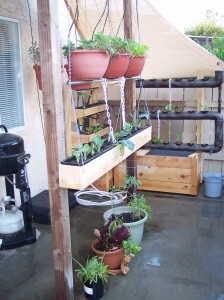 More On My Aquaponics & Gardening Adventures. PatioPonix Starter Unit With Design Improvements. Since my last blog, I have learned a lot from mistakes that I made along the way. Also, I made changes to my PatioPonix design (yes, it has a name now.) A local company showed interest and encouraged me to build them a unit which they will use to try and sell my design, so my second unit is done and delivered. The design moves the sump and fill lines to the outer corners freeing up space in the trays. So far from experience I learned that Ebb and Flow is the best method for watering the plants, the roots are allowed to breath a little so that they don’t rot. I also got rid of the baskets and dumped the rock right into the bin and transplanted the plants right into it. Currently I am using the expanded ceramic however, I just learned that production was stopped because too much salt in the latest mining operation. I am going to try expanded shale in my next larger unit (with a 54 gallon tank) as others have recommended it, although while at the garden store, I was looking at volcanic rock and wondered how well that would do. That will have to be a test in one of the bins and I will report the results on that. This weekend I build 2 hanging planter tray holders, one with two 30″ trays and the other with two 24″ trays. They are setup with drip irrigation on a simple faucet mount timer (all my hanging plants are setup this way too.) One planter is planted with Spinach, Organ Sugar Pod Peas, and Cucumbers. 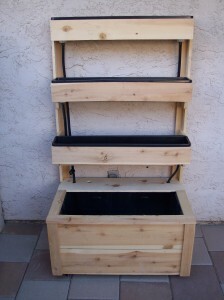 The two 24″ planters will be populated with plants that I am currently germinating. Two 30″ Window Box Planter Liners In A Hanging Cedar Planter. The Two Aquaponic Units In The Background. For germination I have tested several products. The first is an expandable peat with a fine netting. That worked well with some seed types but not others. The next type of seed starter I tried was spun rock or “Rock Wool.” Rock wool was hard to work with, either it it too wet or too dry and the PH must be controlled unlike peat. Two days ago I started seeds in a new product called Preforma. This last image shows one of the completed window-box planters I built as hanging planters. The other is now also done and resides perpendicular from the end post to the wall. The drip watering is also complete. Until next time, Happy Gardening.